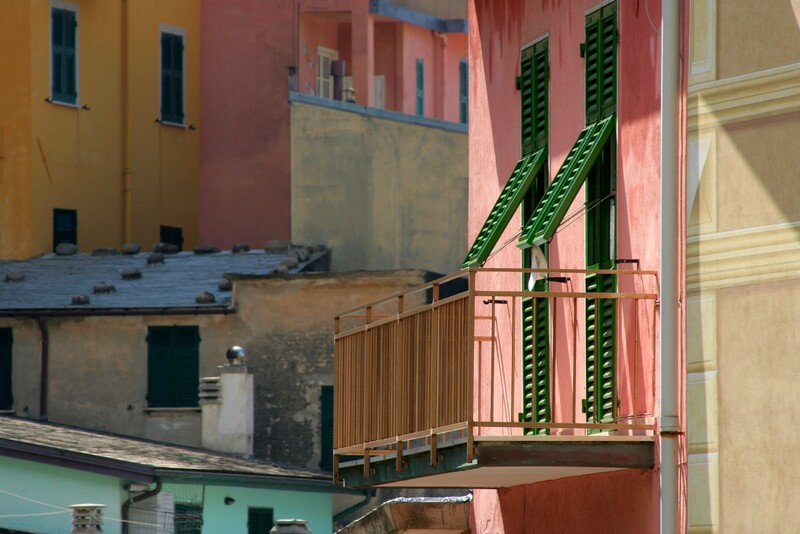 Today’s picture takes us back to Cinque Terre, in northern Italy. If you recall, Julie and I were there a few years back to see our buddies Trevor and Heather get married. (To each other, as it turns out.) 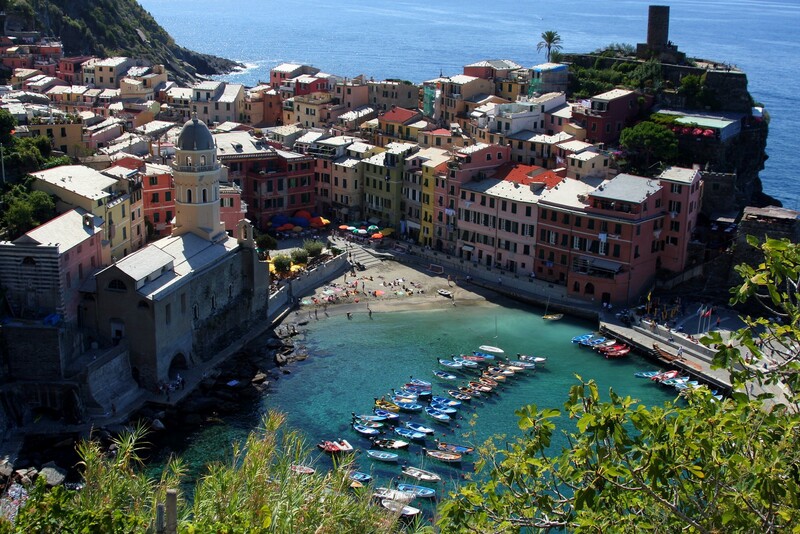 We were staying in Vernazza, but this picture is from two towns down the coast, Manarola. Trevor and I were hanging out there a few hours before the wedding. I mean, what better activity on the day you’re supposed to get married than a little bit of sightseeing, right? 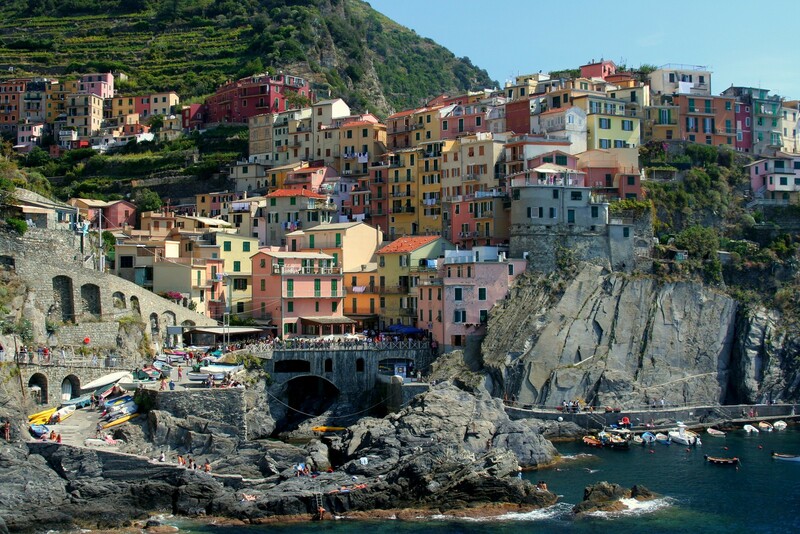 The Cinque Terre towns are all built into the cliffs along the Mediterranean coast. The buildings are all crammed together, all painted really bright colors, with little tiny alleyways and staircases in between. Just simply walking around the little towns was an experience unlike anything I had before. It’s magical, really. Now, a few notes about the picture itself… As you probably realize, I’m primarily interested in landscape photography. I have very little interest in pictures of buildings and such, so consequently I have very little experience and skill taking them. I’m a horrible city tourist, because to me, a city is a city. I’m typically much more interested in seeing the landscape surrounding a city than the physical buildings that make up the city itself. While I was here, walking around these little villages, I of course tried to get the best pictures I could, but as I mentioned, I haven’t developed those instincts for what makes a great shot and what doesn’t. So I did some experimenting, with some good results, and some … not so much. I can’t decide how I feel about this one in particular. There’s definitely good parts to it (the tightly jumbled, chaotic-yet-orderly buildings, the vibrant colors, the focus on the sunny patio), but there’s other parts that are ho-hum (the cheeseball fake texture on the right side, the ugly gutter drain, the fact that I cut off that turquoise building at an awkward spot, etc). But this is how it works – you take a picture that’s pretty good, decide what the good parts are, and figure out how, next time, you can cut down on the not so good parts, so that the next picture you take will be that much closer to being great. And that idea doesn’t just apply to your own photos either. If you’re trying to improve as a photographer (I certainly am), every time you look at a photo, figure out what you like about it, and what you don’t. You can get a lot of great ideas for your own pictures by looking at what other people have come up with. I keep harping on this idea, because it’s really the best way I’ve come up with to improve. It’s a gradual, incremental process, with no finish line. Am I a better photographer than I was a few years ago? Without a doubt. Am I as a good of a photographer as I can possibly be? Not even close. I’ll save that for next week!